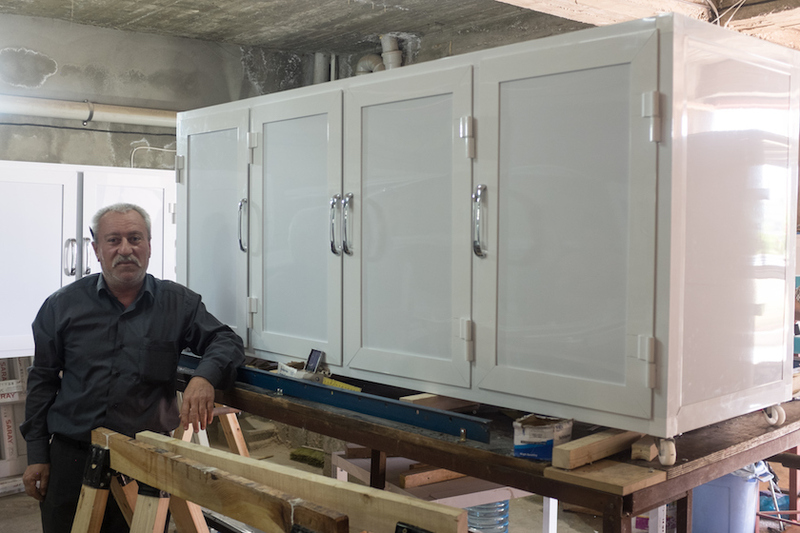 At the second workbench from the big bay door, Sami finished his first set of kitchen cabinets. After tightening the last screw and wiping the dust off the shiny, aluminum surface, he cried. He was relieved and utterly overcome—proud to have made something beautiful and useful for his family. Sami and his brother Fathi shared a workbench. They are good men. They were always good providers for their families. They built sturdy homes with beautiful orchards—five brothers with homes lined up next to each other, from oldest to youngest. Sami and Fathi are Shabaks, a minority group of Muslims, but they had good relationships with their Christian neighbors in their hometown east of Mosul. Nothing could prepare these husbands and fathers for what happened in 2014, when they had to flee ISIS. Nothing could prepare them for being displaced and unable to provide for their families. Nothing could prepare them for starting over from scratch. A few weeks ago Fathi, Sami, and their brothers made the four-hour drive back home from the displacement camp where they’ve lived for three years now. Their hometown is now free and the men needed to see with their own eyes what had become of it. What they found wasn’t pretty. They expected to find their homes damaged, and they were—each one partially destroyed and burned. Their homes and their businesses—shops that once sold appliances, carpets, blankets, and shoes—were so thoroughly looted that out of all of them, the only thing that remained was a single shelf so tightly bolted to the wall that it couldn’t be taken. The stock from their shops—gone. The doors and windows from their homes—gone. The electrical wires and switches in the walls—gone. The olive trees which they nursed through their earliest years—cut down. On closer inspection, many buildings, like this former auto garage pictured above, are salvageable. The windows and doors were smashed out, and there had been a fire at some point. But the structure is still solid. With cleaning and repairs, and with new doors and windows, this building will be useful again. We started this journey with Fathi and Sami back in March. We helped them learn a skilled trade—aluminum and PVC carpentry—that is in high demand everywhere in post-ISIS Iraq, as rebuilding begins. Fathi and Sami learned how to build the windows and doors which will transform concrete block shells back into houses and shops. We spent time listening to their hopes and needs—not pushing a timeline agenda of our own, but waiting to hear from them where and when they wanted to set up shop. Safety, and a way to provide for their families. Their hometown is safe now—ready for their return. The final thing they need in order to go home is a way to provide for their families. And your investment is providing that. The timing couldn’t be more perfect. In a few weeks, after Ramadan draws to a close—after the feast where they will celebrate God’s provision of help and strength during a season of going without—Sami and Fathi, their brothers, and their families will leave the concrete plot they’ve called “home” for the last three years and finally return. To their real home. They will bring their displacement tents with them and pitch them in their former orchards, arranged from oldest brother to youngest, just like their houses. They will fix up their homes. They will set up shop—and they will use the skills you’ve given them to help their neighbors move home, too. They will help repair and rebuild not only their own homes, but their whole community. This is what you make possible when you empower displaced dads and moms across Iraq. You make it possible for them to rebuild, to forge new life after ISIS. You make sure they don’t have to start from scratch. You make sure hate doesn’t have the last word over their lives. This Father’s Day, honor the dads in your life by empowering dads in Iraq to return home after ISIS, to rebuild their lives, and provide for their families.